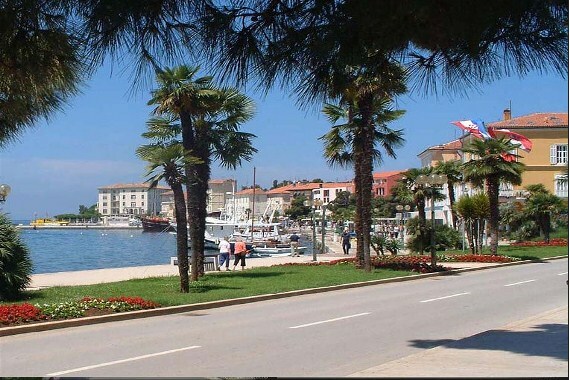 Porec carries the title of the most visited resort in both Istria and Croatia with a good reason. Almost every street is simply pulsing with life in the summer, making Porec a favourite destination, which is inevitably visited by those eager to have a good time and appreciating the variety Porec has to offer. On nearly 37kms of Porec Riviera, almost every wish will be fulfilled: a beautiful coastline bathed by the warm sea conceals secluded beaches for those seeking the peace of the Mediterranean; the rich offer of sports facilities will meet all those longing for an active holiday; the almost immeasurable number of restaurants and taverns will delight everyone's palate; fruitful vineyards that are widely known for their excellent wines; numerous night clubs, bars and concerts under the clear sky offer great time and fun until dawn; old, well preserved, historical monuments unreservedly offer their wisdom; many particular galleries are proud of their remarkable works of art; top quality accommodation in Porecs hotels, camp-sites, stone villas and apartments will satisfy any demand of even the most meticulous visitors. Every year the number of people visiting and staying in Porec increases, confirming its more than deserved status of one of Croatias most attractive destinations. Want to share a review or have a related business. or just ask travel questions. We are here to assist you in any way we can. Its so easy just fill in the boxes as instructed. You can also upload picture's and embed your favorite videos. Your promotion/review/question, will appear on a Web page exactly the way you enter it here.